I’m a user of the camera theta V. I try to recover gyroscope data who are presents as metadata on the video. Does anyone have any idea how can I recover them? If you can’t grab it from the video metadata, you may be able to developer a plug-in for the camera to grab the gyroscope data. I have not tried this GitHub project. The plug-in runs inside the camera, so you don’t need a mobile phone. Theoretically, the plug-in could access the camera gyroscopes directly and add that data to the video file or save it in a separate file and map it to the video. Information on the upcoming plug-in program is here. What have you already tried to grab and parse the video metadata? I don’t think the gyroscope data is accessible from the video file, but I’m not sure. I need to get gyro data from Theta V too. I really want to solve this myself too. I don’t have a solution. 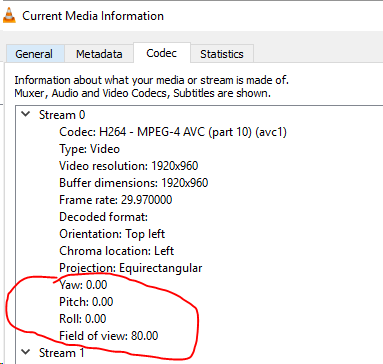 VLC is supposed to display yaw, pitch, roll, but I’m not getting the data in my test. I’m using an old video for a THETA S for the test. If you try it with a THETA V, please post results. Thanks for reporting back. I have another lead on how to get this information. I’m going to ask a guy I know. If I learn anything, I will report back.